Discussion in 'TalkCeltic News' started by Mr. Slippyfist, Dec 4, 2018. Odds-on favourites Celtic were stifled somewhat as Aberdeen attempted to play not so much a game of football, but a game of chess by marking out Celtic's most current influential and creative players in James Forrest, Kieran Tierney and Callum McGregor, and the weather conditions making it a less than ideal platform for Celtic's general free-flowing play, but Celtic enjoyed the majority of the possession and toiled away until they received their reward. The earliest effort of the game came from Aussie midfielder Tom Rogic (known very well to Dons fans) who hit a fierce left-footed shot that looked bound for the bottom corner of Aberdeen's net, only for Joe Lewis to get down well and get a strong hand on the ball and divert it off onto the post. A fine save by the English goalkeeper was quickly followed up by an unforced error, as his misplaced pass out ended up at the feet of James Forrest, only for the on-fire winger to put his cross high and wide. 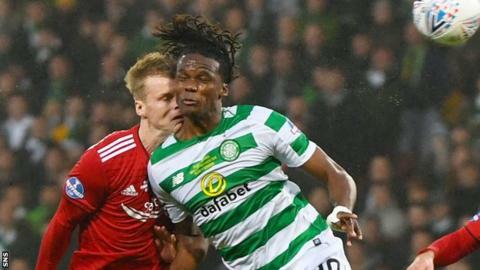 Odsonne Edouard was the next Celt to cause Aberdeen's defence more trouble, as he latched on to yet another unforced error by defender Andy Considine, but his effort was tame and was blocked. Aberdeen kept up the pressure on Celtic's midfield - particularly Lewis Ferguson who stuck to Callum McGregor's backside the majority of the game - and looked as though they were going to see out the remainder of the first half unscaved. But, just as the game was heading into the 40th minute, Aberdeen began to put pressure on Celtic. As the red wave surged forward into Celtic's defensive area, they swung in a cross from wide with Gary Mackay-Steven making an aerial challenge only for Celtic's Belgian centre half to make an excellent diving headed clearance - one which was due to change the course of the game. A horrific clash of heads between Mackay-Steven and the Belgian occured, with both men down particularly Mackay-Steven who appeared to suffer the worst out of the two. Both sets of players appeared to be sickened by the unconscious Mackay-Steven and the opposition Belgian who writhed in agony as the blood poured from both player's heads. During a 6 minute period where medics swarmed the pitch, the Belgian eventually made his way back up on to his feet, and heroically confirmed he was OK to play on the remainder of the game (head wound stapled and bandaged), but Mackay-Steven was not so fortunate as the medics prepared to stretcher him off. Thankfully though, the former Celtic midfielder began to regain consciousness as he was being carried off the pitch to rounds of applause from both sets of supporters in the stadium, and was taken off to hospital (where it was later confirmed that his injuries were not as bad as first feared). The 6 minutes taken out for the horrendous incident proved to be the turning point of the game, as Celtic began to plug away, and just going into the the 5th minute of injury time added on to the first 45mins of the game, Celtic put together an impressive 39 pass move with 9 out of the 11 Celtic players having a touch of the ball. The final pass came from Celtic's Belgian centre half who received the ball and lumped up a long range pass into Aberdeen's defensive area, Ryan Christie getting beyond the Aberdeen defence into a one-on-one with Joe Lewis with a shot that went straight down the Englishman's throat, BUT he could not handle it, and the rebound then fell at Christie's foot again and this time the young Celt would not be thwarted - BOOM! Into the roof of the net and Celtic were 1-0 up, the fans showing total elation and the players even more so! First half drawing to a close shortly after. The second half begun, and Celtic had upped the tempo. Shortly after, Celtic attacked the Aberdeen defence once again, and swung in a ball into the opposition half. Dominic Ball (former Rangers loanee) attempted a diving headed clearance, but - on the edge of his own penalty area - with his tame header actually coming off of his own arm. Referee Andrew Dallas blew his whistle, and after some slight deliberation gave a penalty to Celtic. Celtic's Belgian stopper could no longer continue the game with a hamstring injury, and was replaced on the hour mark with Jozo Simunovic. The Bosnian defender didn't have long to wait before he almost became an influential part of today's story - and not for the right reasons if you're a Celtic fan! Aberdeen's only other decent chance of the game came from a cross by Nial McGinn from the wing area, which evaded the majority of the Celtic defence only to fall to an Aberdeen player to the goalkeeper's right - but Scott Bain stood tall and spread himself as wide as possible (looked as though he had been taking tips from the Artur Boruc School of Block) and managed to do enough to put in a good save, although it turned out to be unnecessary, as the ref quickly blew the whistle for offside. Celtic toiled for a 2nd goal. Further chances fell to the feet of James Forrest, although the recently free-flowing goal-scoring Jamesy could only see his shot drag wide. Sinclair later done well surging forward on the left hand side and getting past a couple of Aberdeen defenders then finding himself out in a good goal-scoring area to the Aberdeen keeper's right, but could only hit off yet another tame effort which the goalkeeper easily dealt with, Edouard absolutely ragin off to the right as it was an easy square across centre from Sinclair that would have been almost a tap-in from the Frenchman. Scott Brown - having started every single cup final under Rodgers up until today - made his comback from injury and had replaced Tom Rogic soon after Simunovic's arrival also on the 60min mark was to be involved in a flashpoint of the game. Not much more action occurred from then on, and Celtic managed to hold on to their one-goal lead, then the final whistle was blown by Dallas. Celtic had won their third successive League Cup under Brendan Rodgers! Celtic (4-1-4-1): Bain; Lustig, Boyata (Simunovic 60), Benkovic, Tierney; McGregor; Forrest (Ntcham 85), Christie, Rogic (Brown 60), Sinclair; Edouard. Subs not used: Gordon (g), Griffiths, Gamboa, Hayes. Aberdeen (4-2-3-1): Lewis; Logan, McKenna, Considine, Lowe; Ball, Shinnie; Mackay-Steven (McLennan 45), Ferguson, McGinn (Wilson 70); Cosgrove (Anderson 78). Subs not used: Cerny (g), Gleeson, Wright, May. Booked: Cosgrove, Ferguson, Logan, Ball. JC Anton, Devlin and The Prof like this.